Powers/Abilities: Marshal Law cannot feel pain, allowing him to carry on fighting even when terribly injured. He is also superhumanly strong, having been seen to lift and throw cars. Other than that, he has no real powers, and relies on big guns and a really nasty attitude to see him through. History: Joe Gilmore was once a superhero, a soldier fighting in the Zone, a South American war where the U.S. altered their men to create supersoldiers. Bio-electronic spinal implants ("Pain Gates") made the soldiers unable to feel pain, but also stripped away any human empathy they had - without the ability to feel fear or mercy, they committed terrible atrocities. Eventually returning home to the city of San Futuro, just after the earthquake referred to as the Big One, the veteran discovered that his experiences as a supersoldier had left him feeling that superheroes were all frauds - he hated them all. So he became a licensed vigilante, Marshal Law, specialising in eliminating any heroes who go off the rails. His most difficult kill to date was Public Spirit, the greatest superhero in America, and the man whose propaganda inspired the once idealistic Gilmore to enlist. 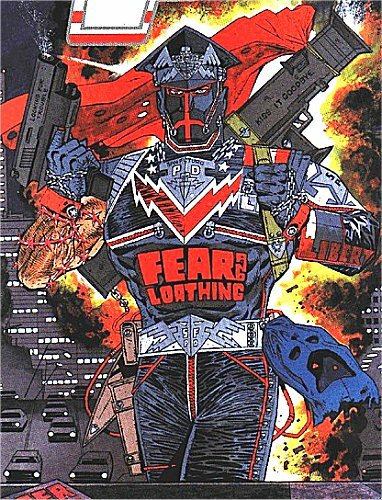 Comments: Marshal Law was created by, and is owned by, writer Pat Mills and artist Kevin O'Neill. Back to General UK Comic Book Heroes. Back to UK Superheroes Main Page.